Odebrecht, the massive Brazilian construction firm, has confessed to an equally massive corruption scheme. A special office inside the company was set up to bribe national governments for contracts and to offer illegal campaign finance to its governmental friends. Corruption is not unusual in large public works projects, but Odebrecht’s systematic and even bureaucratic approach appears unprecedented. In addition, a great deal of information about the scheme has been documented. Brazilian, Swiss, and US prosecutors together took evidence of $788 million paid in 12 countries, publishing summary information in late 2016 (see figure 1, below) and promising fuller details on 1 June, 2017. 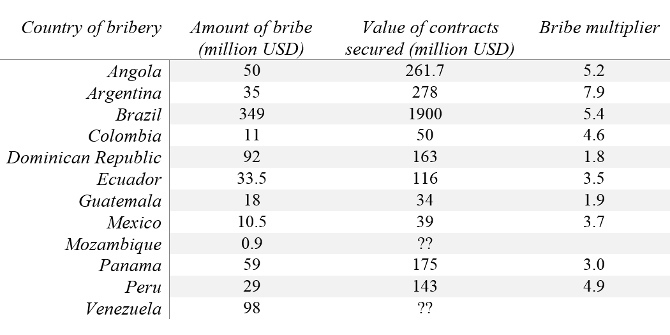 The chart shows considerable variance in how much Odebrecht paid to secure contracts and government cooperation. Differences in the “bribe multiplier” – how much additional business Odebrecht secured for a given volume of bribe – are also striking: comparatively low in Guatemala and the Dominican Republic, highest in Argentina. The information already available has demanded a response from the countries involved, but looking at six major Amazonian countries where Odebrecht has built roads, pipelines, hydroelectric dams, and other large infrastructure projects, it is clear that responses have varied as much as bribes themselves. In Brazil, Colombia, and Peru the response has been effectively judicialised, with national courts taking up investigations into which national politicians and parties accepted bribes and what Odebrecht received in response. In Brazil, the epicentre, the Lava Jato (car wash) cases began with corruption in Petrobras in 2014 and have sprawled well beyond. The cases provided part of the backdrop to Dilma Rousseff’s impeachment in 2016, although the evidence against her accusers in the National Congress was clearer than the charges against her at the time of her removal (formally for financial and budget manipulations). The partisan tilt of the Lava Jato investigation has largely faded given the huge volume of cases emerging from plea bargains by more than 80 Odebrecht employees. They have implicated a third of the current presidential cabinet and Senate, dozens in the lower house of Congress, and many sitting governors and politicians at other levels. President Temer and all of the living ex-presidents face investigations. As hard evidence emerges implicating virtually the entire political class, Brazilian parties, elections, and its judicial system seem likely to be transformed, along with its system of government contracting. The Peruvian judicial investigations are on a smaller scale, but represent a similar response. The legal investigations implicate individuals in the three most recent presidential administrations, including former presidents Humala and Toledo; Toledo himself is accused of accepting bribes that represent about a third of Peru’s total, including for the contract to build the highway connecting the Brazilian Amazon to the Peruvian coast. New President Kuczinski has pledged to allow the cases to lead where they may, while also declaring that Odebrecht should be out of the country by the end of the year. Colombia’s President Santos has also said he wants a full investigation, including of the $1 million allegedly paid to help finance his own re-election campaign in 2014. Neither country faces the depth of political changes that Brazil does, but Odebrecht has been employing 10,000 Peruvians to work on its projects, so the economic blow might be strong. There may be legal innovations beyond individual countries. In February, eleven countries (Argentina, Brazil, Chile, Colombia, Ecuador, Mexico, Panama, Peru, Portugal, DR, Venezuela) signed a Declaration for International Legal Cooperation against Corruption to investigate Odebrecht together, and Ecuadorian, Colombian, and Peruvian investigators have already begun to work together. In addition, some Brazilian legal experts are exploring the possibility of charging Odebrecht for its foreign bribes in Brazilian courts. These sorts of innovations may be necessary as investigations stall elsewhere. Bolivia is the rare Amazonian country that does not appear in the US Department of Justice report. Odebrecht reportedly has no recent contracts in the country, so Bolivians have counted themselves out of the developments. At the same time, other Brazilian construction firms have had projects in Bolivia, as has Petrobras. When Odebrecht retreated from building a highway in Bolivia in the Isoboro Sécure National Park and Indigenous Territory (TIPNIS), for example, its major Brazilian competitor OAS stepped in. Since these firms have been implicated in some of the Brazilian investigations, it seems possible that they also paid bribes in Bolivia, but President Morales has taken a narrow reading of the situation and retreated to the lack of Odebrecht-related charges . Ecuador and Venezuela have gone even further to avoid tackling likely corruption. Ecuador’s President Correa has said the country can do nothing until the information from the US Department of Justice report is released in June 2017 because individuals are not identified – despite the fact that a paper trail presumably exists inside Ecuador as well. Correa’s administration talked with the Justice Department in March but would not cut a deal with Odebrecht. Conveniently, this meant no evidence could be presented of corruption in the last decade under Correa’s leadership before new presidential elections in early April, when his chosen successor and former vice president, Lenín Moreno, was elected. Venezuela, second only to Brazil in bribes paid by Odebrecht, has done least. Many of Odebrecht’s projects linger unfinished in Venezuela, so it is hard to see that anything positive has been bought with the funds. Under President Maduro, the Venezuelan investigations have occasionally promised upcoming arrests, but the most intense activity has been reserved for just a few individuals and opposition leader Capriles. 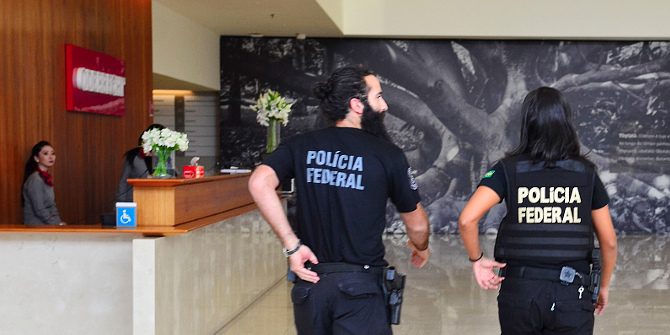 Two Brazilian journalists and activists from Transparency International were also briefly detailed. In the most cynical development, Maduro gave his 26-year-old son (a flautist) responsibility for investigating the unfinished projects. As this summary suggests, the Odebrecht scandal reveals not only the extent of corruption in public contracts and elections in Latin America, but also the widely varying capacity and inclination of different political systems to respond. Stepping back to consider another implication of these developments, we see that many of the funded projects are exactly those that have been the focus of civil society mobilisations in recent years because of their negative socio-environmental and human-rights impacts. The challenges civil society faced seem all the more daunting in light of revelations about the individual and partisan interests behind these projects. This only raises further doubt about what social benefits they actually achieved. Professor Kathryn Hochstetler is Professor of International Development at LSE and holds a PhD in Political Science from the University of Minnesota. Her research has approached the study of environment and development from numerous angles: global environmental negotiations, regional trade agreements (Mercosur), national environmental movements, environment policy, and democratic institutions, primarily in South America. She is the author of Greening Brazil: Environmental Activism in State and Society (Duke University Press, 2007) and co-editor of Advances in International Environmental Politics [2nd ed.] (Palgrave Macmillan, 2014).